Good Monday morning, friends. Like most of the east coast, we're getting blanketed with snow this morning. I'm looking forward to tucking in, cranking up the stove, and once things settle down, eventually heading outside to play a little bit. They're calling for lots of wind later today though, which is usually the one snowy combination that my kids aren't so crazy about playing in. Meanwhile, the chickens have been keeping things interesting around here. 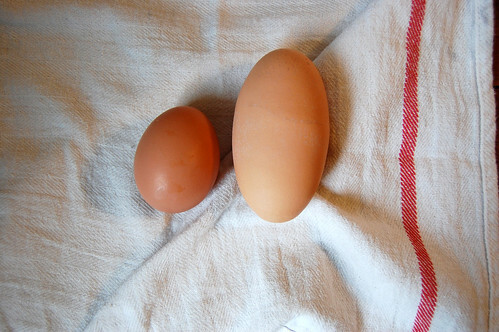 I know I read in one of my chicken books that the eggs would start off small and gradually get bigger. Our eggs have been pretty average except for the one the size of a large marble I found on the floor of the coop. But this one, from last week, has us all pretty speechless. All I can think of is the poor hen who laid it. We haven't cracked it open yet. It's sitting in a bowl in our refrigerator. I'm a little scared to see what's inside. A dinosaur? An ostrich? A little lizard? A giant chicken? My children have lots of interesting ideas. Since this is the second time I've written this post this morning (thank you, typepad for losing the first when I hit save, and not recovering it) I'll save the rest of it for another time. Be sure to stop by the habit blog to meet our new March guests. i’ve got a small obsession with chickens and it was pure delight to find you (i’m new here) and that you keep chickens! i’m trying to think that this snow storm is a good thing, even as i watch the blizzard-y wind blow the snow about. That is one crasy egg! Makes me squirm a bit. When I was a child, we kept hens too – though they were “free-range” in the forest that was our back garden and we had a hard time trying to find where the hens had laid their eggs each morning. I remember the best part about using the eggs, though, was finding one of those special “double-yolkers”. There were three of us brothers&sisters and whoever happened to choose that egg for breakfast felt special for a whole month or so until the next one came along. Oh, good memories! I love your blog. We also have chickens and so enjoy the surprises that are left for us each day. Well almost each day. Some times our hens take a break. That giant egg is really quite special. Wow. My husband would love to eat that one. We are now attempting to hatch our own chicks. Very exciting. That is a funny egg. And the shape is unusual: it’s an almost perfect elliptic egg! oh my gosh that large egg has me cracking up!! and I charged my camera battery for todays snow but that wind may keep us in today too! that egg is hilarious! we have a hen (just one) and her eggs are never exactly the same as the day before, but we’ve never had one like that!! how odd… and yes, poor hen…ouch. Great egg! Oh I just love chickens. My folks raised chickens. It was a wonderful experience. My sister has some too. My hubby and I are currently thinking of getting back into it. We live in a development that doesn’t allow it. So we are seriously considering moving because of all the restrictions. 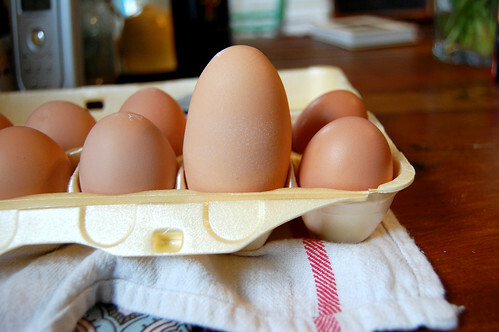 I needed a good giggle today, and your “bigger than all the rest” egg photo did the trick. Thanks! Enjoy the snow, it is still so pretty, but not the same without all those rosy cheeks coming in from sledding. That kind of goes beyond jumbo. I think it may qualify as uber. Is that an official egg rating? I bet it’s a double yolker. I remember when I was a kid, our chickens would occasionally lay eggs that size! There are probably 2 and possibly even 3 yolks inside that one! I can hardly wait until we can build our own chicken coop. Fresh, free-range eggs taste so much better than than those from the grocery store! whoa! that is crazy! is she a new layer? i know sometimes they can be kinda crazy until everything starts kicking in…keep us posted! Look for the book The Odd Egg to read with your kids– you’ll enjoy it after this egg! i miss you and that’s the biggest egg i have ever seen. seriously. odd. We had one like that when our hens were a little bit younger (newer layers). It was a double yolker. twins.have your camera ready! Whoa!!! That’s crazy! Never seen anything like it ’round these parts! that looks like a double yolker if I ever saw one! have you cracked it yet? i am so intrigued. the second photo had me laughing out loud. the eggs seems to have personality. poor tall egg, so different from all his friends. 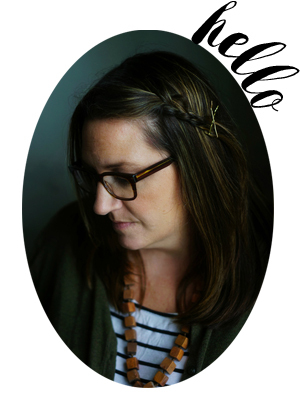 Oh, wow, I think I love you and your blog. I’m new, and I’m trying to tell my brain to come back here every day. Have you cracked it yet? It probably has two yokes. Twins! I’ve been trying to talk my husband into raising chickens when we get our new house with some extra land; but he keeps talking about the mess that they create and why we wouldn’t want to have them around. I visited my grandparents’ farm for two weeks every summer when I was little, so my memories of chickens are fond ones, and not necessarily very realistic. Still, we homeschool like you do (and with a family of 8, soon to be 9, we eat a lot of eggs at one time! ), so I keep thinking it would be a good thing. This post made my day! Either I’m so sleepy that everything is overly funny to me, or that is just a very funny egg! I keep picturing a cartoon chicken in my head; and I keep seeing her thoughts and responses after she laid that egg. First I see her looking somewhat suprised, then a little embarrassed, and then sticking out her chest in great pride as all of the other chickens gather around and she can see them comparing their little average eggs to her monster-sized one. Suddenly SHE rules the roost! Gosh, I didn’t mean to leave that long of a comment, but apparently your egg made quite an impression on me, lol! OMW! that’s a large egg! i guess all i need to say here is OUCH!! But I’m soooo curious to see what’s inside!! we are always creeped out by the big ones, and there’s always something slightly odd inside. I like reading about your bird keeping adventures.